Integrate Slack with your conversations inbox to receive notifications about incoming live chats in a dedicated Slack channel and chat with visitors directly through a Slack thread. Please note: the Slack integration only supports receiving live chats from the chat channel of the conversations inbox, and not the team email channel. You need to have Admin permissions in your HubSpot account. (Recommended) Ask your Slack administrator to temporarily grant you admin permissions in your Slack workspace. These permissions are no additional cost to your company and can be revoked immediately after installing the integration. The integration will not be removed after your Slack admin permissions are revoked. Temporarily give a Slack admin at your company a HubSpot Sales Hub Starter, Professional, or Enterprise user role and admin permissions in your HubSpot account so they can install the integration. The integration will not be removed once they are downgraded or removed as a user from your HubSpot account. In your HubSpot account, navigate to Conversations > Inbox. In the bottom-left corner, click Inbox Settings, then select Slack. In the Slack Integration section, click Connect account. In the dialog box, click Connect to Slack. Please note: pop-ups must be enabled in your browser to reach the next step. If nothing happens, allow any blocked pop-ups and then try again. 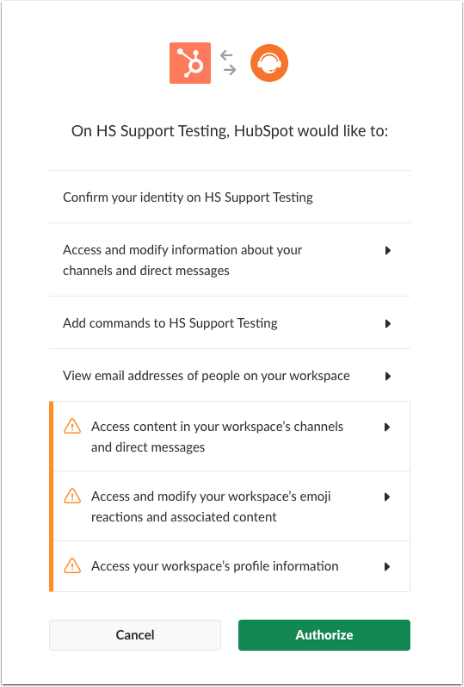 On the next screen, click Authorize to allow HubSpot to access your Slack account. In your Slack settings in HubSpot, click the Select channel dropdown menu to select a Slack channel where you want new conversations to be sent. To disconnect Slack from your messages, click Disconnect from Slack. Please note: if you're sending notifications to a private Slack channel, you need to invite the HubSpot app to that channel. After selecting the channel, @HubSpot in the channel so your notifications come through. By default, Slack notifications are turned on in your inbox settings. Once the integration is set up, a notification will be sent to your designated Slack channel when you receive a new message. The notification sent to Slack contains key information about the conversation: the initial message, status of the conversation, page chatted from, who the conversation is assigned to, and the HubSpot owner of the contact if known. Click Reply in Inbox to be taken directly to the conversation in HubSpot. Alternatively, you can reply via the Slack thread. The whole conversation will still be logged in the inbox in real time for reference. 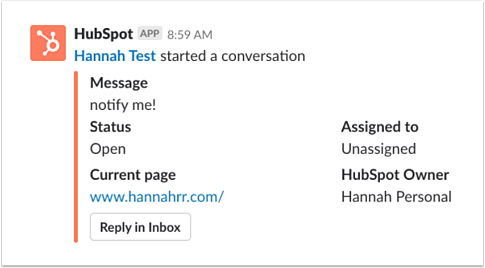 If you're assigned a conversation before you've mapped your HubSpot user email to your Slack user email, you must claim the HubSpot user identity in Slack before sending replies. Click Claim [user email address], then you will be able reply to the conversation. You can also change you availability status directly within your integrated Slack channel. To set yourself as away, type the command /hs-chat-away, then hit the Enter key. To set yourself as available, type the command /hs-chat-available, then hit the Enter key.